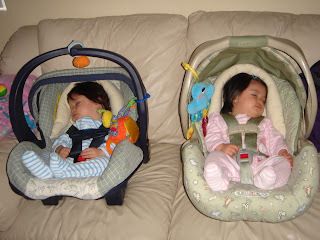 This is how the twins come home from their Dr. visits. Knocked out after the tramatic experience of getting shots. At least they don't have to go back until they are 9 months old. The twins are 6 months old now, so they had to get their 6 month shots. They each got 4 shots!! Of course they cried, but it wasn't too bad. Lili is 15 lbs 2 oz and Felix is 15 lbs 5 oz. When I took Chone to the Dr. the other day she weighed in at 58lbs. She finally gained some weight. Lili's 6th tooth cut through her gums on Monday, finally! It was starting to really bug her, therefore, she was starting to really bug me with all her fussing! Felix still has none. All of us, except Luis, have colds/coughs. It started with me, then I gave it to all my kids. The other night Felix's mocos were so bad that we tried to use that suction thing they give you in the hospital, and he FREAKED OUT!!! They hate it when we clean their noses, so I can't wait until we are all better. Chone's pink eye is clearing up, but she is still taking the drops, which sting. There is definotely something in the air! My kids are getting better too. And Andrew had Bronchitis, so this has been a sucky past couple weeks. glad i dont live with you! !